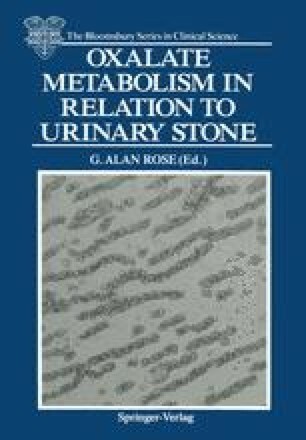 Crystalline deposits found in urine have long been associated with the formation of renal stones. By the 1930s most of the common crystalline deposits in urine had been identified and the acidic or alkaline conditions in which they are usually seen established (Ball and Evans 1932). Phosphates of lime and magnesium were known to be soluble in acid urine and deposited in alkaline urine. Similarly calcium hydrogen phosphate was seen in faintly acid or alkaline conditions, whilst calcium oxalate in the form of dumb-bell or envelope-shaped crystals appeared in acid and alkaline urine.